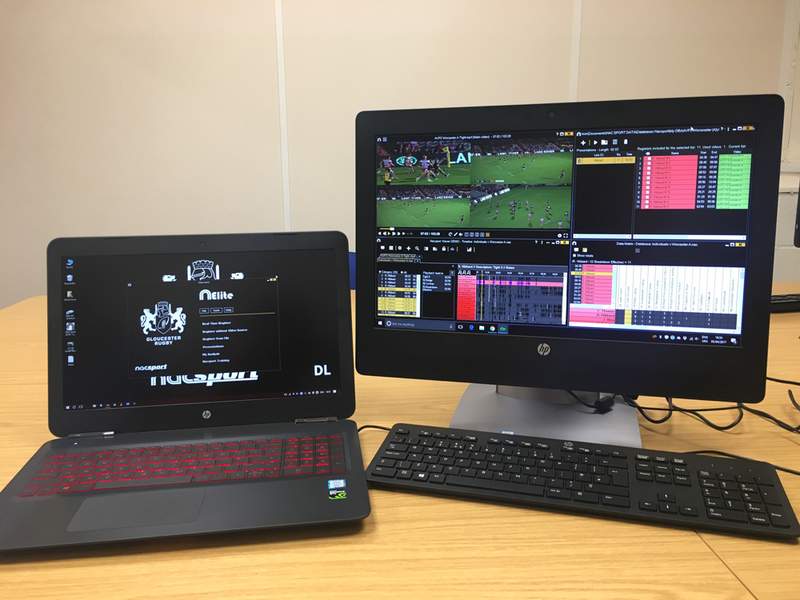 We would really like to thank Darren Lewis, Head of Performance Analysis, for his detailed insight to the video analysis processes at Gloucester Rugby and sharing how making the move to Nacsport is going to impact the club. We are really looking forward to seeing you guys make the most out of the possibilities in Nacsport! Hi Darren, please could you g give us an overview of your role at the club? My role is Head of Analysis Department at Gloucester Rugby. The department consists of myself, Tom Reynolds who works supporting the first team players and coaches and James Macfarlane who is the Academy analyst and works with the Academy coaches, but also helps with some elements of the first team’s analysis provision. Between the three of us we facilitate the analysis resources for the players and coaches at the club. Up until recently, all your video analysis work has been carried out in SportsCode but now you are moving over to Nacsport. Were there some key factors which made you want to investigate Nacsport further in the first place? Correct, I have been a SportsCode and Mac user in the roles I have had since I completed my degree, which was a long time ago now, initially as Bureau Co-Ordinator for the CPA at Cardiff Met working with the WRU, four years as Head of Analysis at Bath Rugby club and in my current role with Gloucester. I actually had a demo of Nacsport nearly five years ago now and at the time, I probably didn’t give it the attention it deserved. The reason for that is that to be honest, I didn’t feel it was where it needed to be for it to be a genuine option to consider, and at the time Bath were heavily invested in SportsTec products, so it wasn’t really a good fit to do anything back then. Fast forward five years and the product has transformed, combined with Gloucester’s current situation it means that the time is perfect to make the move. The development and transformation of Nacsport is unbelievably comprehensive and across all parts of the product. One of the main considerations with what is really and truly a huge change, is that the coaches would be comfortable using the software. The coaches at the club are very good in terms of being able to use what we currently have to prepare for meetings and each have slightly different workflow’s but essentially, they have used SportsCode for a long time, so making sure they can continue to be self-sufficient in the way they prepare using Nacsport was a fundamental factor to making the change. Given some of their reactions to the training session you recently delivered, I think it’s safe to say that will not be an issue and if anything will make their lives significantly easier and certainly enhance what they can do with their analysis when they get stuck into it. From my point of view, being able to continue to do some things like use four stacked angles, manage clips for presentations and obviously register live and post event are all key workflows that I’ve used and developed during my career. I’d also be lying if I said the cost of the entire solution wasn’t a factor. It is. Every company has budgets to work to and the fact we are getting way more bang for our buck by making this transition was something that any business would smile at. The cost of hardware has been halved and we’re now working with HP Omens that have the same power as a MacBook Pro for literally half the cost … my Director of Rugby and finance department are very pleased. With Nacsport already being used in your Academy and after trialling the software yourself, how happy are you that Nacsport will meet all your video analysis needs? Is Nacsport enabling you to do everything you did before? Nacsport's ability to import packages from SportsCode and deal with XML and data inputs has meant the link has remained seamless between senior and academy rugby at the club, even though they’re using Nacsport and we’ve been using SportsCode. But, the very short answer to your question about how happy I am that Nacsport will deliver everything we need it to is…YES! From your side, how have you found communicating with the Nacsport team and seeing the way that they work with you? It has been remarkable to be honest. The open mindedness to look at things we were trying to achieve and then find the easiest and most effective way to get it done is exceptional. The team have done a great job putting the program where it is. I know that when you say you’re going to do something, it’s going to happen, which as a customer making a significant change is totally refreshing.